Who was the leader of the Pedants' Revolt? "I dunno. Ages ago. 1900?" Of course, the only proper response from any self-respecting grammar pedant upon hearing that joke is to ask "How are you apostrophising that?" Although I wouldn't class myself as an expert in grammar and punctuation, and my lessons in such things are now some thirty years in the past, I do find myself amused and irritated by a what seems to be a widespread lack of understanding of some of the simplest of rules. Everyone makes mistakes, of course, and in writing about it, I'm bound to have made a few myself.... but are apostrophes (for example) really that difficult? Is it that hard to understand the difference between an apostrophe indicating an abbreviation and one indicating possession? People say that it doesn't matter and that language is rapidly evolving to the point where they will become redundant, but I just don't understand why it has to be so hard. 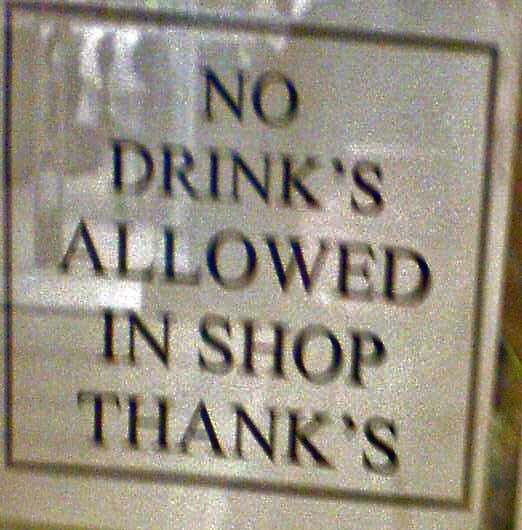 People laugh at the most obvious examples, where someone has seen an "S" on the end of a perfectly normal word and panicked themselves into an apostrophe. For me though, the worst culprits are those who should know better: the communications team in our office are surely guilty of gross incompetence every time they release a missive with a typo or a flying apostrophe. We all make mistakes, but isn't the job of a communications team to communicate? Aren't they paid to get these things right? Is it just me who finds that simple mistakes undermine the credibility of whatever message it is they are trying to get across? We've got a display in our office at the moment. As a big retailer, it's part of an ongoing effort to help people in the head office stay as close as possible to what goes on in our shops. This particular display is a set of glass shelves that are showcasing the ten product lines that sold the most across the Christmas period. As I spent a couple of days working in one of our shops towards the end of December, I'm familiar with a few of them and it is actually quite interesting to learn what products our customers were buying. It's a shame then, that these quite nice glass shelves are all painstakingly painted with the message "Our Customers Favourite Products". Every time I walk past, that missing apostrophe screams at me. Those shelves don't look cheap, either. Am I alone in thinking it must surely be someone's job to get that sort of thing? Are they held accountable for that sort of mistake, do you think? Do they even know they've made a mistake? If they're still there next week, I might attack them with a big, thick marker pen on my way out of the building for the last time. ** yes, actually he does know how apostrophes work. I d'ont unders'tand your'e view's. I said to a student yesterday that his poor punctuation made my teeth itch. I am so with you on this! Ha ha, I'm pleased to see that there is no longer only one pedant. You are a man after my own heart in this respect. I put it down to my advanced age and grammar school education. I personally think that precision in the use of language is very important but when I try to rationalise this, I don't really know why.